FEMALE:- (Stage IV) : Prosome slightly inflated. Body short. Urosome 3 segmented. Endopod of antennae with 2and exopod with 7 segments. Cutting edge of mandibles asymmetrical. Anterior tooth of left and right mandibles with 5 thick spines each, but the posterior tooth of the right mandible with a bifurcated tip and that of the left mandible with a single pointed tip. First inner lobe of maxillule with 8 setae second with 2 and third with 1 setae, second basis with 3 and endopod with 1 setae, outer lobe with 5 and exopod with 6 setae. Maxilla consists of 6 lobes, each provided with 3,2,2,3,2 and 7 setae respectively. Spines absent on 5th and 6th lobes. Maxilliped long and furnished with plumose setae. Swimming legs symmetrical and biramous. Legs 1-4 more or less similar in morphology, having two-segmented exopod and endopod. Leg 1 smaller than the following threee pairs, coxa with one small inner setae and basis with 1 long outer seta; endopod segment 1 with one inner seta and segment 2 with 7 setae; exopod segment 1 with 1 inner seta, one long outer marginal spine and one long terminal spine. Coxa of leg 3 with 1 small inner seta; basis without seta; endopod 1 with 1 inner seta, segment 2 with 8 setae; exopod 1 with 1 small outer spine, 1 long terminal spine and 5 inner setae. Coxa of leg 4 without setae; basis with 1 long seta, endopod 1 and 2 with 1 and 7 setae respectively; exopod 1 with 1 small outer spine, 2 with 2 small outer spines and 1 terminal spine and 5 inner setae. Leg 5 smaller in size. 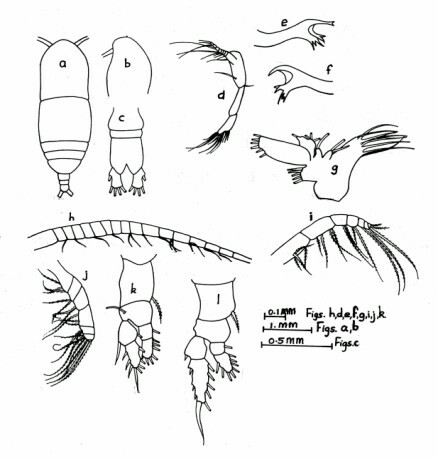 Coxa without setae; basis with a long setae; endopod and exopod one segmented; endopod with 6 setae; exopod with 3 inner setae, 2 outer spines and 2 terminal spines, one 4 times longer than the other. 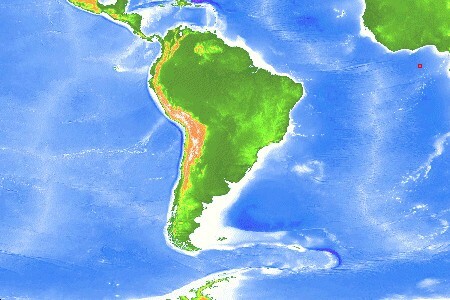 Additional remarks : First recorded from the Indian Ocean (Saraladevi.K. 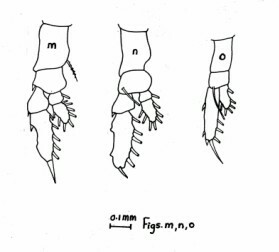 1977).In the original description of Haloptilus bulliceps Farran does not mention whether the specimens are males or females and no indication of male characters, like geniculation of antennule, asymmetry of 5th leg etc. are given. Hence there is possibility of it being stage IV female. The present specimens are characterized by the absence of geniculated antennule and in having small symmetrical 5th leg which are evidently female characters. a. female dorsal (stage IV), b. forehead (sideview), c. urosome, d. antenna, e. mandibular blade (right), f. mandibular blade (left), g. maxillule, h. antennule, i. maxilla, j. maxilliped, k. 1st leg, l. 2nd leg. Haloptilus bulliceps (after Saraladevi, 1977)m, n, o. 3rd to 5th legs.